We are pleased to release herewith the 112th (June 2016) edition of your ezine PreSense broadly with the following contents. Readers may be aware that in June 2015, we released the Digest of select articles upto the 100th edition with the title PreSense100. 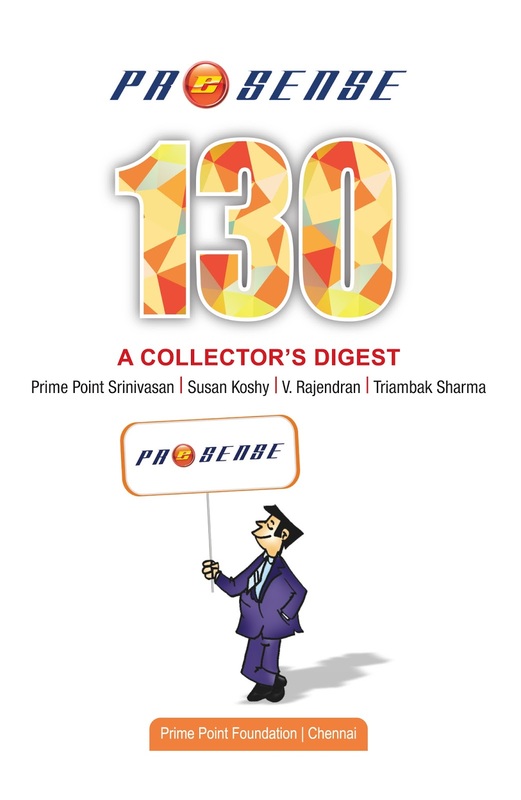 Now, we have released the second edition of the Digest containing select articles upto 110 editions with the title "PreSense 100+" during Sansad Award function held at IIT Madras on 11th June 2016. The soft copy of PreSense100+ may be downloaded from the following link in pdf format. 1. Editorial: Susan Koshy writes on the present hysteria over RBI Governor Raghuram Rajan's exit. 2. Box item: Launch of PreSense100+, Digest of articles upto 110th edition. 3. Cover Story : K Srinivasan writes on the urgent need and importance of the Electoral Reforms. 4. 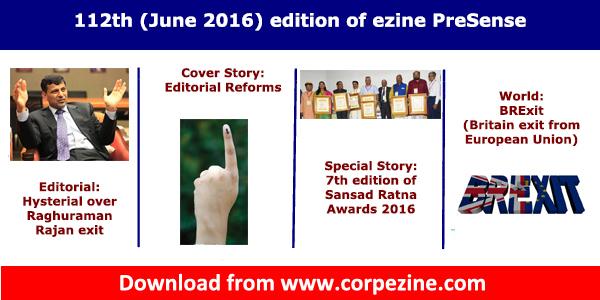 Your ezine PreSense honoured 5 Lok Sabha MPs and one retired Rajya Sabha MP for their outstanding performance in the Parliament during the 7th Edition of Sansad Ratna Award 2016 event. A brief note on the event and videos of the proceedings. 5. Nation: Sukruti Vadula Narayanan writes on the recent launch of PSLV C 34 which carried 20 Satellites making every Indian proud. 7. From the Archives of June 2010: We reproduce an interesting article on how youngsters get into Debt Trap through credit cards. This is more relevant today, than it was 7 years ago. 8. Triambak's usual Prince Cartoon. Please send us your feedback. Please also share the ezine with your contacts.